As I mentioned last week, I’ve found some wonderful new-to-me writers via Twitter. Among these is Lisa Hendrix, writer of the Immortal Brotherhood series. The series is an interesting conflation of history, fantasy and romance, which are pretty much my three favorite things. Labeling these paranormal romances really doesn’t do them justice, but if paranormal they must be, they’re the first ones I’ve ever really liked. The premise of the series is that during the early Viking raids on Britain, a warrior named Brand led his men into battle against a witch named Cwen. When Cwen sent her son against them and he was killed, the witch cursed Brand and his remaining living men, forcing them to spend the whole day or the whole night as a beast. She also made them immortal in order to prolong the torture forever. When we join the story in Immortal Warrior , Sir Ivo de Vassy has been created the new Lord of Alnwick by King William Rufus, son of William the Conqueror. At least, he is at night. During the day, he turns into an eagle and he is determined not to let the newly-powerful Church burn him as a demon so he hides his nature. He has been rewarded by the King with both land and a bride, the granddaughter of the former, now disgraced Lord. Our heroine Alaida is not the kind of woman to sit back and quietly accept the dictates of those around her and at the start of the story, she has been hanging onto her lands, manor and virtue under very the difficult circumstance of her male relatives and protectors having been arrested and imprisoned for treason. She has a keen sense of responsibility to her people and she can’t quite abandon that, even when it means taking the King’s man as her husband and lord. The romance starts with a forced marriage, but it’s not all sunshine, roses and some kind of external plot device from there, which would have been easy when there’s a robust and overarching plot to work with. These two have some serious issues to overcome and have to grow together. Even with several other important secondary characters, two of whom we have to assume might eventually get their own book, I never felt short-changed by the relationship between Ivo and Alaida. There are a thousand things to love about this book. Ivo and his friends are portrayed as if they really could be a couple hundred years old. They have the loneliness, weariness, wisdom and humor that seem inescapable to me in characters who have seen that much of life and death, but that most writers of immortal characters ignore in favor of perpetual angst. Also, Alaida is a strong, independent woman who is nevertheless honestly bound by the limitations that the laws and mores of her era place on her. Though it’s painful to consider a woman being given as a bride by a king she barely knows to a man she knows not at all, ignoring the reality of the society where the story is set is not at desirable to me as a reader and this book rings true to me in a way few other recent historicals do. Finally, the way Ivo handles Alaida places him above the expectations of his time in a way that is both romantic and yet not anachronistic. He’s just the right mix of warrior and tender lover. Hendrix even uses the cultural differences between the Norse and the Normans to explain some of his behavior. Speaking of culture, I am consistently impressed with the research that has gone into these books. Politics, law, religious dogma, building and transportation, and yes, cuisine, are all things that Hendrix has taken into account. However, it manages to provide a foundation for the story and never ends up reading like a textbook, which can sometimes happen when a writer wants to impress readers with their knowledge of historical trivia. And since each book in this series takes place a couple hundred years after the previous, this is a tremendous accomplishment. This first book contains a bit more in the way of exposition than the subsequent ones in the name of world-building and the introduction of important characters like Brand, the former war leader who turns into a bear during the day, and Ari, the story-teller and seer who turns into a raven at night. It makes for a book that runs a little slower than the subsequent two, but it’s utterly necessary in order to establish the overarching story arc. That’s handled masterfully, by the way. It’s present, but never dominates the character development and ultimate unification of the primary couple. In some ways, it’s harder to write a review of a book I adore and have no criticisms of than it is one that contains significant flaws. Hendrix is just a tremendous talent and I can’t wait for more books in this series. I am not a historian, culinary or otherwise. So when I said I was making a foray into Anglo-Saxon cooking, I was kind of fibbing. Hendrix does make reference to apricots stewed in honey and wine, but I’m not sure poaching is strictly period-appropriate. Also, vanilla, that most prosaic and ubiquitous of baking ingredients, wasn’t popular in England until the late 18th century. 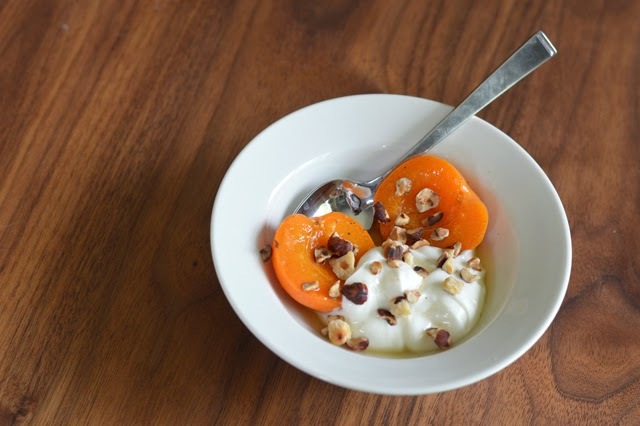 While the use of vanilla in this recipe is admittedly taking full advantage of creative license, I tried the apricots without it and it was entirely too one-dimensional for my modern palate. However, the history of yogurt is much more ancient. 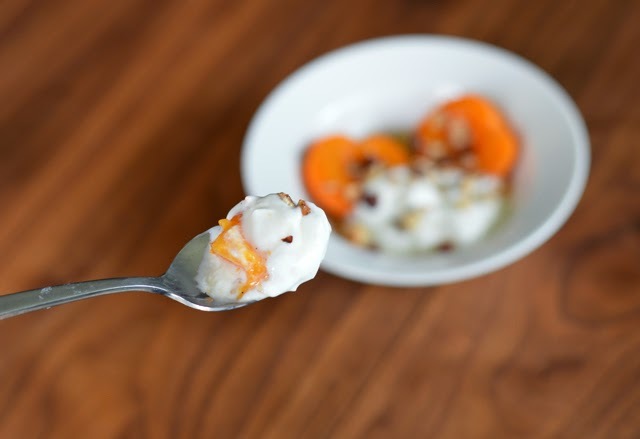 The historical record traces yogurt production back to Central Asia in about 9000 B.C., though with the presence of milk and the absence of refrigeration, things like the invention of yogurt seem almost inevitable. And indeed skyr, the thick Icelandic yogurt I have here, appears to have been invented in the 9th century, about the same time the Vikings were settling Iceland. So if the Normans didn’t yet have yogurt, I’m going hijack Ivo and company and say they brought it with them. If you can’t get skyr where you live, just use Greek yogurt. Because this preparation is simple, quality is important here. So local honey, a decent quality wine and something other than thin store-brand yogurt should be the order of the day. 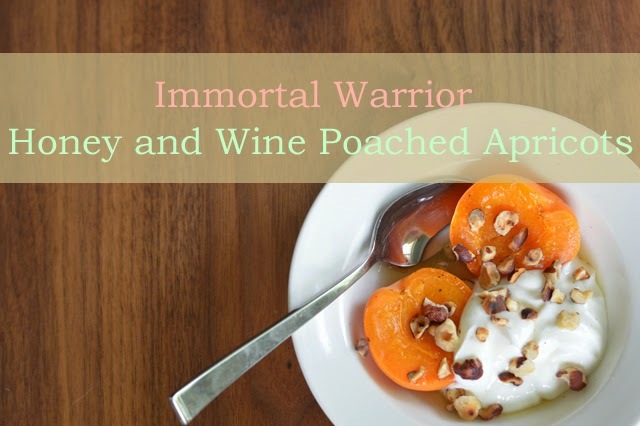 Apricots are just coming into season so this is exactly the right time of year for poaching them. Picking out firm, but not rock-hard ones will yield the best result. 1) Combine wine, vanilla bean and seeds and honey in a medium saucepan. Bring to a simmer over low heat. 2) Add the apricots, completely submerging the fruit. 3) Simmer gently, until they are just tender but not falling apart, about 2-5 minutes. My firm fruit took 3 minutes. 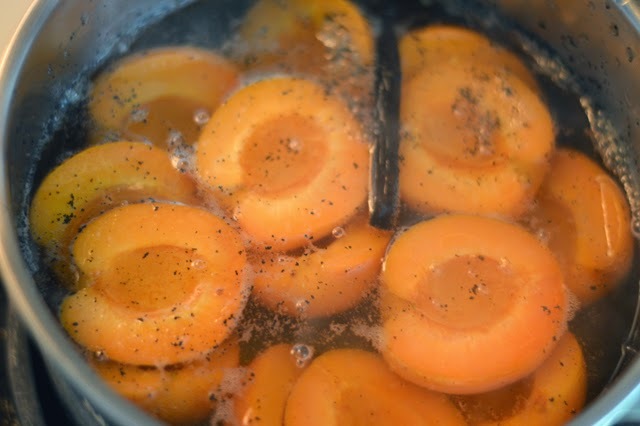 4) Using a slotted spoon, transfer the apricots to a dish. 5) Let remaining liquid simmer over medium-high heat until reduced by half and lightly syrupy, about 12 minutes. Strain to remove any escaped apricot pulp. 6) Allow the apricots and syrup to cool, then refrigerate. 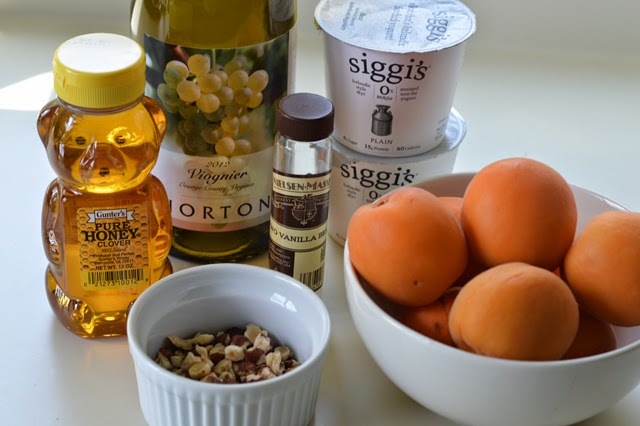 7) Combine the yogurt with the remaining honey. 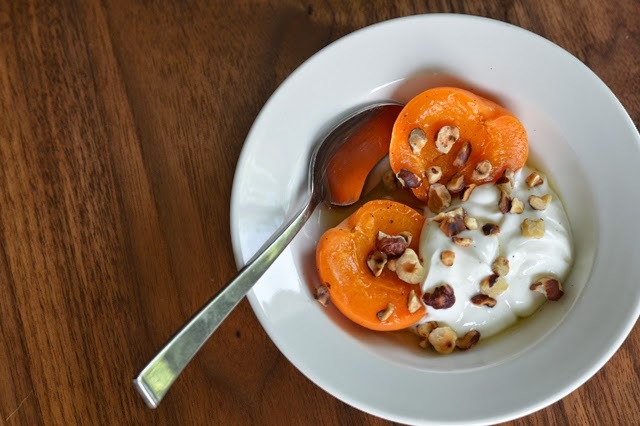 8) Serve 2 apricot halves in a shallow bowl with 1/4 cup yogurt, top with one teaspoon hazelnuts and a scant tablespoon of the reserved syrup.